Posted by shwaldman in Family, Society, Technology. When I was growing up, I tracked every penny that went through my hands. I kept these journals that listed my lunch money, my birthday gifts, my purchases of baseball cards. I had hundreds pages of numbers categorizing how I spent my money. I don’t recall exactly when I started this, probably elementary school, but this was before I had access to spreadsheets, databases, or accounting programs on computers. We didn’t have a computer in our house until high school. I took a lot of flack from my family about how ridiculous this was, but somehow I knew it was important to understand where my money went and I needed a way to track what I felt was important. I also know I like watching the numbers growing the saving column! Over the years, life got busy and I stopped this practice. I admit was a time-consuming and little overbearing. Life also got more complex, with different types accounts and credit cards and married life with joint accounts. These complications make it nearly impossible to watch every penny. I tried using Quicken for a while, but there is still such a difficult time of entering (or manually importing) in all the transactions that occur in day to day life. I did like it once the data was in there to be able to see the categories and breakdowns of where money went. But it was still very time-consuming. And then came Mint.com. For someone like me, this site is amazing! It is like dream. Heaven, if you will. Once you create an account on the web site, you are able to simply enter in the login information for the websites of each account you access online. Of course the thought of data security is immediately a concern. Once you get past that, the site is simple and yet fully featured (see my recent post on technology). 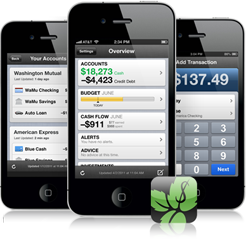 You can take checking and saving accounts, loans and investment accounts. The site handles sites that use complex web log ins where users are prompted with security questions. You can even add your home and car to help give you a full pictures of your net wealth. The site links your home to Zillow.com to pull in the real-time “Zestimate” (although this is kind of depressing to see right now). I hope at some point they are able interface with Kelly Blue Book values, but I am sure that is more about KBB being a little behind the times in offering the proper developer interface into their data. When you add account for the first time, the site retrieves as many transactions as possible (usually 90 days). Unfortunately, it does allow you to import more, but I don’t see that is a big problem – all the more reason for you to get started now. Once the transactions are pulled into Mint, the site automatically categorizes the best of its ability each transactions into car payments, dining, pharmacy, daycare… there are highly level categories and then subcategories – which you can even modify if you choose. These categories allow you to create budgets and build graphs on how you are spending money. The one difficulty I have found is being able to manage cash expenditures, but that is unavoidable. The site does allow you to add cash transactions that do not affect account balances, but merely add to the detail of the categories you are hitting with your dollars. The site is free and so are the iPhone Android applications. For all this functionality, I would be willing to spend a few dollars, but they are able to pay for this site through “helpful”, unobtrusive advertising. Since they have access to your spending habits, they are able to “suggest” vendors for new credit cards or refinancing loans or other services. The way they have included these things are hardly noticable unless you want to use them. Like the rest of the site, it is perfect. The phone app is great too, it holds nearly as much functionality as the website, but it is consolidated into a clear interface that allows you to see where the accounts are, re-categorize if necessary or check the status of your defined budget lines. I have used this site for a few months and I can say it will meet all my needs. And even when it doesn’t, the interactions I have had with their customer service have proven that they will work to do so in the future updates. I had a problem with the site being able to recognize certain types of accounts and with a couple of screen shots and emails back in forth, there was a patch installed on the site and my problem was solved. I can say, I could not be happier with this site. I hope everyone finds it useful and Americans are able to keep our spending under control as we turn this economy around.